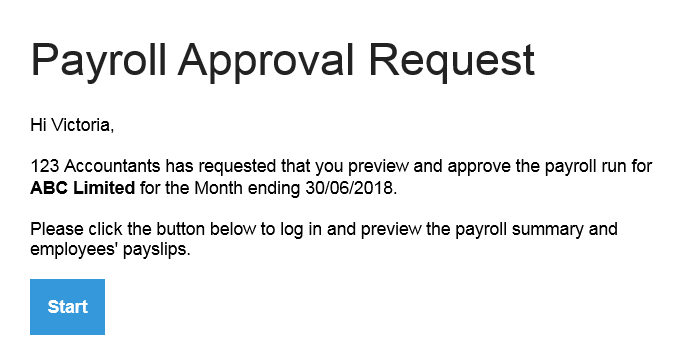 A Payroll Approval Request allows a Bureau (admin user) to send an approval request to an Employer (standard user) through Connect, so that their client can review and approve the payroll data created by the Bureau in BrightPay. Clicking the 'Start' button will bring the employer to the login page for their Connect account. After logging in, the employer will see the Payroll Approval Request and the employees included in the request. The Employer has the option to either approve or reject the request, as required. If everything is correct, the Employer can click the 'All looks OK. Approve the payroll run' button. The Bureau will subsequently receive an email to their registered email address as well as a notification in their Connect portal to notify them that the payroll data has now been approved by the Employer. If the employer wishes to reject the request, they can simply select 'Something’s not right. Reject the Payroll Run'. The Bureau will subsequently receive an email to their registered email address to notify them that the Payroll Approval Request has been rejected.